What is it and why is it Changing? What factors are causing climate to change? Lets start with what you know. Go to the following web site, Climate questions, and try to answer the 20 questions on climate . Make sure you make notes to assist you in answering the questions listed above. At the end of this task you should have several written notes on the definition of climate and the factors that affect climate. One of the factors affecting the climate of an area is the global address of a place. For example, Chicopee's location on the Earth is described in terms of it's longitude and latitude. Refer to the definition of these terms in your book or notes. Now, go to this web site to find the global address of Chicopee (world climate data). Write this address down on your notes and go to the globe in the room and locate this latitude and longitude. Find a place on the globe that has zero degrees latitude. What kind of climate would you expect to find here? Write down your answer. Don't stop here. Go to this site for even better answers to your questions: factors affecting climate. By now you are well aware that climate is influenced by temperature. So what factors influence temperature? In this next site, you will learn learn about the natural and human factors that affect temperature. You will learn two new terms, global warming and ozone. the possible changes that may occur in our natural environment. Read through the entire page. 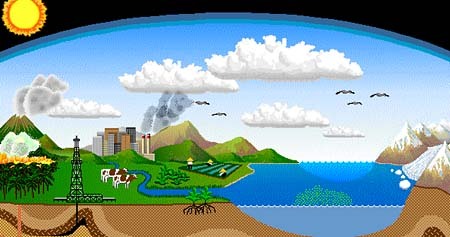 Write down specific examples of how climate change may affect people, plants, and the sea level. You have successfully completed the on-line component of this unit. A list of eight factors that affect climate. A brief description of each one of these factors. Two examples of what could happen in nature if climate changed. now located at a latitude of 23 degrees. Answer: The temperature would be warmer because we would be tilted more directly towards the sun. We would also have more hours of sunlight. This would cause different types of plants to grow. It would allow us to grow more vegetables throughout the year. Warmer temperatures would mean greater evaporation which could result in more rainfall. climate systems - Describes several factors affecting climate. Third in a series of sites.